Combine the flour, yeast, sugar and salt in a large mixing bowl. Add warm milk, oil, egg & vanilla. With electric mixer, beat on high for two minutes. Reduce speed, add raisins and about 1/4 to 1/2 cup more flour until the dough forms a mass. Knead on a floured surface for 100 turns (about 2 minutes). Cover dough with plastic and let it rest 10 minutes. Divide dough into three and roll each piece into a 20-inch long rope. Braid the ropes as you would braid hair and shape the braid into a circle, pinching & tucking the ends together. Place on the baking sheet, cover with a towel and let rise in a warm spot until doubled in size – 45 minutes to 1 hour. After 30 minutes, preheat oven to 350° F.
When loaf has doubled in size, gently brush with egg wash.
Bake for about 30 minutes. After 15 minutes, cover with a foil tent to prevent over-browning. Internal temperature should be at least 190° F when baked. Let cool for 10 minutes and add glaze, followed immediately with sprinkles. Note: To see it shaped into a regular loaf click here. 43 Comments on "Christmas Wreath Bread"
so many good things my x is polish came here after ww2 she live in hell tell she and her mother came a lot of good things with them food that is. My parents came to Canada from Poland after ww2 and my dad cooked all the Polish food that I love. This sounds similar to a Babka recipe I made recently. Do you have a good Babka recipe for us? 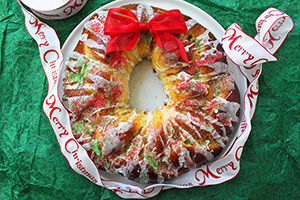 I want to know if there is a video of your show stopping Christmas Wreath Bread. I enjoy watching your videos, and would like to watch you make this bread but can not find one for this bread. Please let me know soon, Christmas is coming. Sorry, there is no video. In your baking recipes when you use 1% milk can I substitute 2% which is what I drink? I’ve used 2%. The loaf is delicious! Hi Jenny, would 2 teaspoons of yeast equal to 1 packet of yeast? I just want to make sure I get this right before trying this yummy recipe. Thank you! One packet is about 2 1/4 teaspoons but 2 teaspoons should do it. A packet of yeast is about 7g. Two teaspoons is about 9g (yes, I actually measured it) so if you have dried yeast loose then two teaspoons will be fine. Thank you David and Jenny! Our packets are 8g. I’ve used the whole packet. Turned out well for me. You can share your photo using the link provided. Just go to “Your Photos” at the top. I just got around to making this a few weeks after the holidays, but still–this is awesome! It’s got the perfect level of sweetness. How do I store? I want to make a few days before Christmas. Can I freeze? And do I add red hots and glaze after defrosted? This is a hard question because I am not a fan of day-old bread. Fresh bread is the best bread. If you make it a few days before, freezing would be the better choice. Then you would have to warm it up to add the glaze and sprinkles, etc. but I have no idea how that will turn out compared to having it fresh. Personally, I would recommend making sugar cookies or biscotti or pecan balls, all of which keep really well and are stress-free when made in advance. Girl I came upon your site and I made your…. PUMPKIN PIE…..IT WAS TO DIE FOR….and my German SHEPARD Tobias wanted the crust……Thank You for the recipe……Your the Ticket…..Merry Christmas….. Please look through my recipes and may find something close to what you’re looking for. This bread is really best eaten fresh. After two days, it will not be as good as it would be fresh. It’s not really a great bread for storing and giving because the glaze will also become dull after the first day. I would recommend that cookies make a better gift if made ahead. My sugar cookies travel well and last a very long time. Hi Jenny, I just made this bread this morning and my whole family loved it!Thank you for this recipe, God bless you! Your recipes do not print when I use google chrome — blank pages appear. I have to switch to Internet Explorer to print them. I am using Windows 7 – I don’t know if that’s the reason or not. Hi Jenny iIlove your videos,I am trying out the bread recipie right now make in 5 mins.I want to try the christmas bread next whooo hoo you rock! 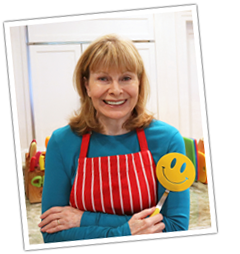 Hi Jenny–Can this recipe be made in a bread machine? I don’t think so. It has to be braided by hand. can I use the leftover egg white for the egg wash instead of another yolk? It won’t be as rich & glossy as with the yolk. I use my leftover egg whites for scrambled eggs and for making my chocolate-dipped coconut macaroons. No, there is no video for the macaroons. Do you think there could be a substitute for raisins? I’m thinking of possibly dried cranberries or perhaps just baking it without raisins. By the way, I found your site about a month ago and have made so many of your recipes…pan pizza and cinnamon rolls and pea soup are mmmm. My husband loves it all. Thank you Jenny. This bread is good plain but you could substitute dried cranberries, currants, dried cherries, or some Polish sweet breads use candied citrus peel. Yes you can and I have adjusted the recipe to indicate that. Thanks I’m making it right now:-) . Jenny, never assume you’re only talking to women. You mention braid the dough like you braid hair. Ya, well my long hair days are long gone and I never braided, so how does one braid the three “ropes”? This recipe begs for a video. Think of the Christmas outfits you could wear and then surprise us at the end like you do in a humerus kind of way. Merry Christmas. Thanks so much, I think I can follow that. Should look great! Hi Jenny–would this bread be made essentially the same way your cinnamon raisin bread is made, save the frosting? I was thinking I could follow along with that video to make this bread. It is a similar technique except you would not roll the dough into a rectangle and cut into strips. That was necessary to put in the cinnamon filling. With this bread, you only cut the dough into three and roll each piece into a rope by hand. (it’s actually easier than the cinnamon-raisin “tunnels” bread) Good luck. Let me know how it turns out.